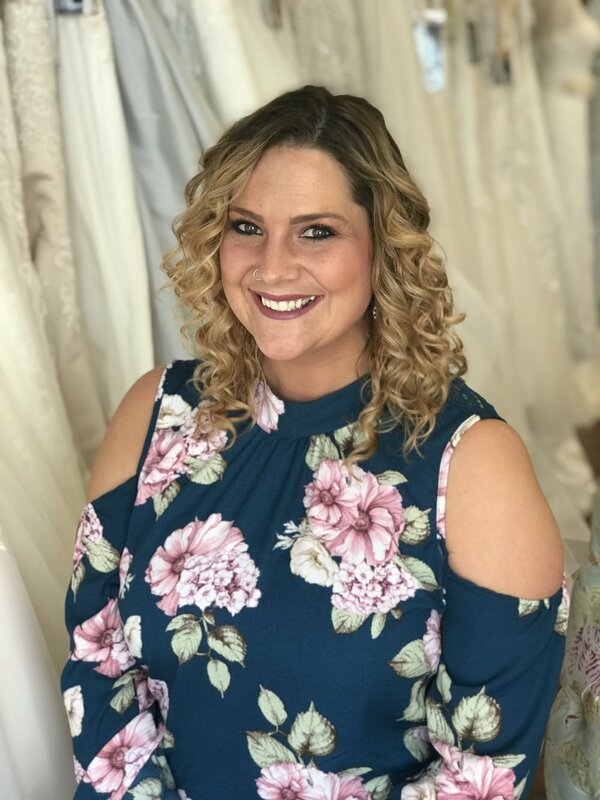 I’m Emmy, Blush Bridal Boutique has been a lifelong vision of mine; my family should have known when I was wearing veils and bridal gowns at the age of 3! I have always loved fashion, I spent much of my teenage and early adult years creating eclectic designs from pieces I had in my closet and key accessory pieces that I picked up randomly. Just because I was on a tight budget didn’t mean I couldn’t create something fabulous from the pieces I had! Fast forward to 2006 when I became engaged to my now-husband John. I relished at the opportunity to shop for the perfect gown and accessories. I felt my shopping experience fell flat, I was discouraged with the overall formality, pressure, and the personal attention that I didn’t receive as a future bride. In 2010, John and I moved our family to Lincoln and my dream of Blush started to become a reality. It turns out the Lincoln marketplace is the perfect place to open Blush Bridal Boutique and I can’t wait to work with all of my Blush Brides! Hi, I'm Shannon! I have loved weddings for as long as I can remember... So when I got engaged in 2009 I was so excited to look for my perfect dress. After an exhaustive search I finally found an amazing dress, but wasn't blown away by the experience. I am here to make sure that you get that experience that I didn't have and form a great relationship with you in the process! I love the saying, "the things you are most passionate about are not random, they are your calling." It really resonates with me because I am so thrilled to be making this my life's work. I started working at Blush in May of 2014 as a Stylist and worked my way up to being the Manager! In this role you will usually find me at the front desk when you come visit, answering any questions you might have, assisting the other employees, styling brides, or creating the window displays each season. I also feel blessed with the opportunity to go on trips to Bridal Markets to decide on the gowns that are right for our shop and our brides! When you're ready to start shopping, give me a call! I am so excited to meet you and enhance your dress shopping experience! Why, hello there! My name is Sarah. I come to you as a Blush stylist excited to get to know more about the unique and special individual you are. Over 15 years ago, I began working in a locally owned business that was especially female driven. As I have grown as a woman over time, both personally and professionally, I know I want to stay in the world of making individuals (like you) look and feel your absolute best. When I am not working, I am spending time with my family. My husband and I have been married since the summer of 2015! We have two wonderful fur babies, Irie our black lab and Napa our golden retriever. They are unquestionably our first loves. Although, coming in a close second is travel! Whether we are going to a baseball game, white water rafting, or touring a winery, we just can’t get enough of exploring the outdoors. I fell in love with the bridal world the second I stepped foot into my first bridal shop as I began my own journey for “the one”. I was like a kid in a candy store! I had both great and not so great experiences in my hunt for the perfect dress. But, my goal as your stylist is for you to love every last minute of your experience start to finish. I recently heard that your wedding dress is the “most self expressive garment you will ever purchase”. To say the least, this is one of the truest statements I have ever heard! And I can’t wait to be the one to help assist you in finding the perfect expression of yourself! Hey, I’m Carissa! When I’m not busy helping brides at Blush, I’m at school working towards becoming a wedding planner or working with my internship! Working at Blush and with all the beautiful brides at the store helped me realize that weddings are more than just an enjoyable hobby to me, and decided to pursue wedding planning as a career. I also love spending time with my wonderful husband who I married in April of 2014. We love traveling and adventuring around the country, but also enjoy watching Netflix and eating brownie batter! As far as fashion goes, I have a hard time not buying anything I see with polka dots. It’s a real struggle! But I also have found a new love for casual/boho summer clothing, but I also love dressing up and feeling classy. I guess you could say I’m all over the board with my fashion choices! I’m constantly browsing Pinterest looking for new inspirations for weddings when I’m not helping my friends with their wedding plans. I’m honored to be a part of making your experience as a bride the best it can possibly be. My goal as a stylist at Blush is to make your experience so comfortable and fun that you hardly want to leave! It’s one of my favorite things in the world to see a bride glowing with the knowledge that she is going to look absolutely gorgeous in her bridal gown on her wedding day. I also want to help give you the full picture; it’s not just the dress! We will pay close attention to veils, jewelry, and even shoes! These are all important factors in making you feel like the most beautiful bride possible. I can’t wait to help you find your dream dress and accessories! Hi! My name is Lisa. Working in bridal is not just a job, but a passion for me. I love what I do and look forward to every new bride I get to meet! All brides have their own unique style and my goal as your stylist, is to help you find the perfect dress. I will listen and help you through the process of making this big decision. Together we can customize your dream gown and truly make it one of a kind! When not working at Blush, you will find me spending time relaxing with my family. My husband and I along with our three boys, enjoy golf and love to spend time outdoors. We host tons of summer cookouts and enjoy our time with friends. Friends and family are so important. Bring them along on your journey! Having a great support system from the special people in your life is priceless. I look forward to being your stylist and can't wait to help you find the wedding gown of your dreams! My name is Molly! I'm a born and raised Lincoln resident, who loves adventure! I'm 25 years old and the lucky mama to a very cute 1 year old! I am getting married at the end of August 2017 to the love of my life! I actually started my journey with Blush, when I said yes to the dress there in Fall of 2016! I have always had an interest in fashion, and was ecstatic when I made my appointment at Blush because of the unique, trendy and timeless looks of the gowns they carried. The ladies helped me find the dress of my dreams, and that inspired me to enter the world of bridal! When I am not working, I am spending my time with my family! My 1 year old keeps me busy and we love to do all kinds of fun activities. My fiancé is a small town guy so we go back to his hometown often for him to teach me "how to be country"! I love exploring and having all kinds of new experiences! I really enjoy cooking for everyone I know, and if you ask them, they love it too! I am overjoyed to be a bridal consultant at Blush and give other women the same awesome experience that I had! It is so empowering to help other women along one of the most exciting experiences of their lives! I look forward to meeting, and making fun memories with brides! Born and raised in Lincoln, NE. My interest with bridal started when I began my wedding dress search and said yes to my dress here at Blush! My experience was amazing, I was initially so nervous about trying on dresses, but the minute I walked in the door at Blush I felt relieved. The entire appointment was focused on what I wanted and envisioned for my dream dress. Everyone at Blush was full of smiles, so friendly and patient with me when I had no idea what kind of dress I wanted or what would look best on me. They answered every single question I had and explained everything in detail so I wasn't left with any questions. It was the most personable experience. I never thought I would have as much fun trying on dresses as I did. I left the boutique and told my Mom that I hope every woman gets to have that awesome experience like I did! My goal as a bridal stylist is to provide that same wonderful experience to every single bride. I am so excited to get to know you and learn all about your wedding, and help you find your dream dress here at Blush. When I am not working, I am busy planning my own wedding in May of 2019! My fiance and I love to travel, especially seeing the mountains and snowboarding. I have a soon to be step son who enjoys the outdoors just like us. We have 2 adorable dogs (a german shepherd and a chihuahua terrier mix). I can't wait to meet you and show you how fun bridal shopping truly is! Sign up to receive exclusive discounts and Blush Bridal love letters!